« When butter was its own food group! Attack of the imaginary chewdaddies. 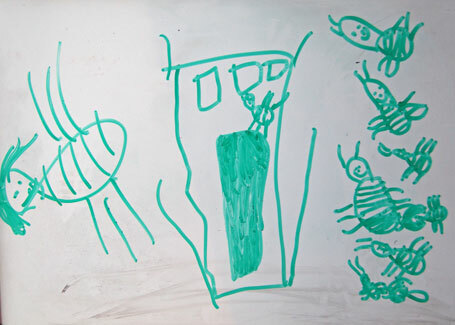 "Bedbugs", by Esme Topcik, age 5. Where has Domaphile been, you ask? We were swallowed up by June. The month that is both the torment and the joy of the working parent. We have been going to pre-school graduations, recitals, publishing parties, end-of-year picnics, school plays, sleepovers, camp orientation, swim tests, more picnics… you get the idea. This is the time of year where I feel like I have suddenly found myself trapped inside a complicated video game that has been set to a skill level far above mine. You take your basic, work-life balance (or imbalance, as the case may be) and you add to it an unholy amount of commitments you can’t possibly all honor – except they are all important. Sprinkle in few inexplicable ½ days of school courtesy of the NYC Department of Education (wtf?) – just to throw you off your game. Oh, and why not throw in some house guests and your husband’s 40th birthday party, just to make it interesting. That’s got to be, like, level 7 already in this game I like to call “domestic bliss”. If you think you just might be actually managing all this, let’s take it to another level – how about adding in some bedbugs? Now you’re truly fucked (sorry mom, there really is no other way to describe it.) Game over. Kenneth: Oh my sir. It looks like you got a bad case of the Chew Daddies. Ozark Kisses. The Woodsman Companion? Bed bugs. They’re a big problem in New York. Jack: I don’t have bed bugs, Kenneth. I went to Princeton. Kenneth: Sir, anyone can get them. Back in Stone Mountain even the mayor had bed bugs. And she…was a horse. Kenneth: Mr. Donaghy’s got Blue Ridge Quilt Ticklers. Oh sorry, bed bugs. Breckman: Bed bus? Can’t those live in your clothes? Kenneth: That’s true, Mr. Donaghy. The mayor had to burn all her pant suits. The odd thing was, none of us had any bites. Vera had no new bites and her rash was fading fast. There were no signs of any bugs in our apartment and believe me, we looked. As I started talking to people (there was no keeping this to ourselves, Vera had already informed the entire 2nd grade) I found out that just about every third person has had some experience with the curse of the Blue Ridge Quilt Ticklers. It’s big business in NYC. As in, it would behoove a shady inspector who was referred by an exterminator to give you bad news, and then kindly tell you to call the exterminator. We called a few more people for second opinions. One guy pointed out that we don’t have any physical evidence of bites or bugs and told me to call back when we actually have them. So we waited, inspecting our children, heat-treating our clothes, and sleeping poorly. Still nothing. Yet. If you look up bedbugs online, go straight to bedbugger.com. They have all the information you need to know. Avoid looking at images of bedbugs. Trust me, it will just make it harder to sleep at night. It is not a bad idea to invest in bed-bug repelling mattress covers. If they do make their way to your home, at least they will not be getting all up in your mattresses. 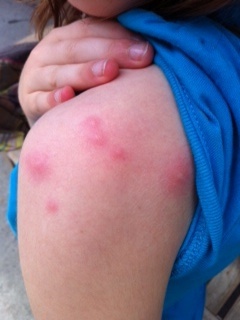 Bedbugs are everywhere! Movie theaters, cabs, hotels, airplanes. You can go nuts starting to digest the disgusting implications of this. So don’t even try. That said. If I were going to a hotel, I might take a look at the Bed Bug Registry. I have a friend who travels frequently for work and always checks before making a reservation, to avoid waking up with the Ozark kisses. And keep your luggage away from the bed. Since the most likely scenario for getting bedbugs is to bring them home after traveling, it is not a bad practice to wash and dry the contents of your luggage as soon as you get home. If you are really paranoid, you could also spray down your luggage with rubbing alcohol and keep it in a sealed plastic sleeve (we just bought one at Bed, Bath, and Beyond because, yes, we are now that paranoid). If you do suspect you have a problem, your first challenge is to find a reputable inspector/exterminator. If you live in a building in NYC, the management will hopefully help you with this (depending on their level of commitment). I wish I could give you the name of the right people to call, but we never got to that point. Chances are, you might have a friend who can give you a solid recommendation. So, that was June. Our own harrowing adventure in modern, urban domesticity – one we hope never to revisit, yet are now prepared. To the bedbugs I say, bring it! We will crush you. Further Reading: McSweeney’s Internet Tendency: Global War on Bedbugs, by Alan Good. This entry was posted on July 3, 2011, 12:37 pm and is filed under housekeeping. You can follow any responses to this entry through RSS 2.0. You can leave a response, or trackback from your own site. WOW my you guys are troopers, I hope you guys have the best JULY EVER, you deserve it for sure. Thanks Stuart! So far so good… but I am scarred for life! Awesome painting! Jolly bed bugs at the gates.